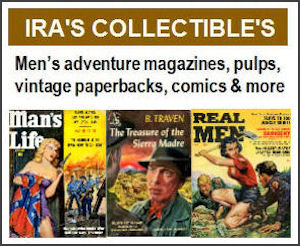 In case you missed them, here are links to Part 1 and Part 2 of my interview with Bruce Minney, one of the top illustration artists who did cover and interior paintings for men’s adventure magazines in the 1950s, 1960s and early 1970s. Bruce, my impression is that men’s adventure magazines were important markets for many illustration artists from the mid-Fifties to the early Seventies, as mainstream magazines increasingly used photos for their covers and interior pages. BRUCE: Yeah, that’s true. A lot of the mainstream magazines that once used a lot of illustration art, like McCall’s and Saturday Evening Post, were switching to photos or just folding up and going out of business. Of course, those were the kinds of magazines I really wanted to work for when I moved from California to New York in 1955. But the trend was against you. BRUCE: Yeah, it was. But the men’s adventure magazine kept a lot of illustrators going. BRUCE: Is Jim Bama still alive? Yes, the last I knew he was alive and well and living in Wyoming, still doing his famous Western art. BRUCE: That guy, he could paint like God. Especially his Western art. My God! Did you ever hang out with Jim? BRUCE: No. We met each other once while we were waiting to see Larry Graber, the Art Director for Magazine Management at their office in New York. I remember Jim told me how much he admired my work, which floored me. He may just have been being nice. That’s the only time I saw him. I’m not surprised that Bama admired your work. 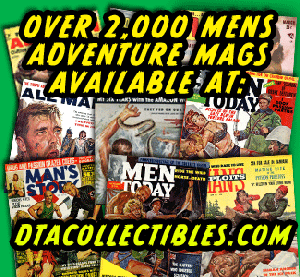 Today I’d say you’re viewed as being right up there in the top tier of illustration artists that worked for the men’s adventure magazines by people who know the genre. BRUCE: Well, thank you very much. When you were working for the men’s adventure mags, how many paintings would you do in a month? Could you tell me a little bit about the types media you used for your illustrations? Did you normally use watercolors and gouache, like many illustration artists did back then? BRUCE: Yes, I did. And, I also used casein for a number of years. It’s sort of like using watercolors, but when it hardens, it hardens like a rock. I guess it’s a lot like egg tempera, but it’s milk based. Casein was very big at one time. Casein paint was sort of displaced by acrylics. BRUCE: Yes. And, of course, I used acrylics, too. Later in my career, for paperback covers, I’d start a painting with watercolors and then go over it with acrylics, and then go over that with oils. The watercolors were very thin, and the acrylics were thin. And, the oils would cover up all the brush strokes from the acrylics. You would use all three in one painting? BRUCE: Uh-huh. For paperback cover paintings. Some of the paperback company art directors would take a magnifying glass and go over the entire painting and if they saw a brush stroke they would call you in to get rid of it. They wanted it to be very photographic. So, that was kind of a pain. Oh, and I used a projector, by the way, as a lot of illustration artists did for both magazine and paperback covers back then. I would sketch in the figures just lightly on the illustration board, and the landscape in the back. Then I put photos of the models on the projector and projected them on the board. And, sometimes, if I had a landscape, I’d project a landscape photo. Did you keep many of the paintings you did for men’s adventure magazines? BRUCE: I did for a period of time. But then I was moving around, you know, from coast to coast. And, they just got to be a bigger load, and a bigger load, I thought what the hell am I saving all of these for? They aren’t gonna be worth anything. So I threw them all away. You did? Omigod! You literally threw them away? BRUCE: Yeah. It didn’t seem worth carrying them around all over the country at the time. I guess there would have been three or four hundred of them. And, they’re heavy, you know. They’re on illustration board. So, anyway, I threw away the ones I had picked up and saved. Do you remember what year it was when you threw them away? BRUCE: Around 1981, when I moved from New Jersey to California. Gil Cohen told me a story like that when I interviewed him, [See Part 3 of my interview with Cohen.] In the 1970s, he got tired of storing the hundreds of paintings he’d done for men’s adventure magazines, so he put them up for sale in a bin in his brother’s hardware store in Philadelphia and sold them for a fraction of what they’d be worth today. BRUCE: I did something like that, too, before I threw mine away. I took my family and a bunch of illustrations down to Atlantic City. We had kind of a picnic day on the boardwalk. And, I put a bunch of my paintings in bins and sold them cheap. People were buying them for $3 to $5 each. Maybe some of your paintings that show up on Heritage Auctions and eBay come from that. BRUCE: Maybe. But I didn’t sell that many in Atlantic City. So, I always wonder where most of those paintings come from. Who first put them on the market? 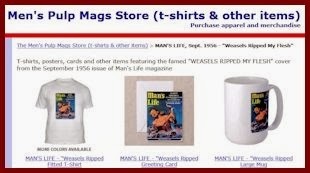 Was it the people who worked at Magazine Management? Did they take home the ones that I didn’t pick up and keep? Could be. 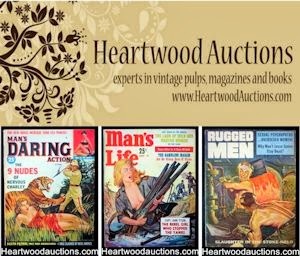 My friend Rich Oberg, who owns the largest collection of original men’s adventure magazine paintings in the world, has dozens of your cover and interior paintings. I think he got most of them from a few art dealers who specialize in illustration art and from the Heritage Auctions site. BRUCE: I sold a few of my illustrations that I had kept on Heritage Auctions. It’s funny that the racy ones are the ones that people want the most now. BRUCE: Yeah, my daughter Carole and her husband Tom told me they saw that one on the Internet. I didn’t remember that one until they showed it to me. It’s a great battle scene, done as a black and blue duotone. It’s actually one of the few duotones I’ve seen that was used as a cover painting. Bruce, I know that you did a lot of paperback cover paintings in the 1980s after the men’s adventure genre disappeared and you moved back to California. Did you keep painting into the 1990s? BRUCE: Some. But in the Nineties, even a lot the paperbacks started using photographs or just raised lettering on their covers. So, that work kind of dried up, too. And, there were so many illustrators out there, hungry for work. In fact, I remember it got so bad that sometimes the publishers wouldn’t pay you for a long time. I did a job once and they didn’t pay me for six months. Six months later they pay you. After you put out money for models and did all the work. And, when that happened I said that was the end, I’m not doing this anymore. Anyway, around 1993, I moved to Florida, near Daytona Beach. Then I went into ceramics. I did that for about ten years, doing these tent shows. How did you get started doing ceramics? BRUCE: I had taken a class in ceramics in California, before I moved to Florida. And, I came up with this wonderful design for African violet pots. They were pretty special. Your son-in-law Tom Ziegler sent me a photo of one. It’s really gorgeous. BRUCE: Oh, yes. People were eating them up. I sold thousands of them. All over the world people have my African violet pots. [He laughs.] I had people buying them from Japan, France, Germany. Even Greenland, once. And, that was profitable for some years. But I quit that after about ten years and I’m not doing it now. Now I’m doing some fine art paintings and collages. BRUCE: Well, I’m doing people, figures, mainly. Do you have a website for your new art? BRUCE: No, not yet. But Tom and my daughter Carole are working on it. They take good care of me. I’ll look forward to seeing that and will post a notice about it when it’s up and running. Tom told me he did recently create page showing some of your new collages on the etsy.com website and they are very cool. Well, it has been a great pleasure and honor to talk with you, Bruce. Thank you very much! BRUCE: It was nice talking to you, Bob. Thanks again to Bruce Minney, to his son-in-law Tom Ziegler for setting up the interview and sending me photos of Bruce, his ceramics and his recent artwork, and to my friend Rich Oberg for the photos of the original paintings he owns and the cover scans that go with them. 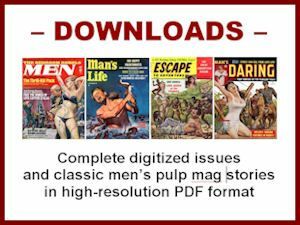 A digitized copy of the complete magazine, in high resolution PDF format for only $3.99.